Wheels of Steel DJing - Testimonials. 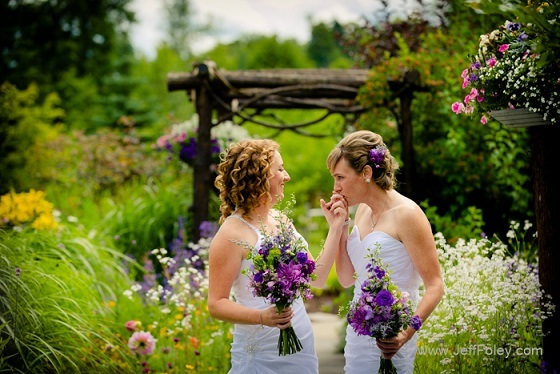 "Planning a wedding from a 12 hour distance, and under a tight budget, can be a daunting task for any bride. Given this circumstance, I truly had to make the best of my planning process by carefully selecting vendors in the Upstate New York area that could provide flexible, reliable, top of the line yet budget friendly services. 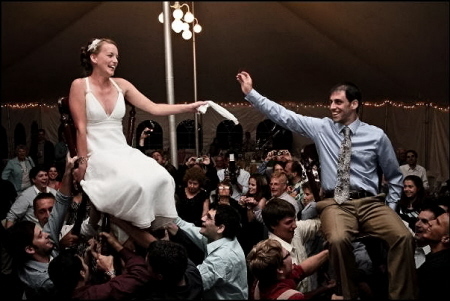 One of my biggest challenges was to find these qualities in a DJ for my reception entertainment. Through initial research, I found DJ’s online but grew disappointed and discouraged by their impersonal approach, high pricing, and inflexibility. I finally asked my reception site coordinator for suggestions in the area to pursue, and he gave me the contact information to Bernie Brown, Wheels of Steel DJing, in Constable, NY. When I first called Bernie, I learned that he unfortunately already had my July 12th, 2008 date booked for another reception. However, he gave me great advice on how to best seek DJ services in the area, provided me with knowledge on average pricing, referred me to another DJ he recommended, and offered to keep my information in the event anything changed. I was immediately impressed with his professionalism and willingness to help even though I could not book his services. Low and behold, a few months later, I received a call from Bernie with the news that my date was now open. He had kept his promise with exceptional follow-through, and I had finally landed my DJ. Bernie Brown was absolutely amazing to work with from day one. Throughout the planning process, I can honestly say that Bernie was very organized. He did this through consistent emailing and a visit to my house when I was in town for a quick weekend with short notice. Bernie took note of all details – I barely had to do a thing! He was very open to all my suggestions and even took on a new challenge. I really wanted to incorporate a lighting feature to my venue – an “R” lit up on the dance floor for our first dance as a couple. Even though Bernie had never offered this service, he researched the possibility, ordered the lighting gobo and equipment, and let me keep it as a souvenir – all for a nominal charge. He absolutely went above and beyond to ensure my day was special. Bernie dressed professionally for the occasion and had the equipment set up an hour before my ceremony even started. (This really calms the nerves for a bride!) The music was a hit. Not one song went played without a crowded dance floor. He followed through with my “play” and “do not play” lists and provided smooth transitions throughout the evening. 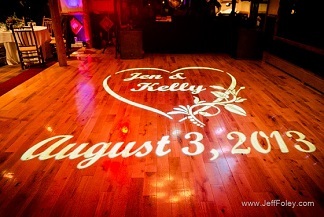 His innovative lighting effects were the icing on the cake, and I had so many compliments about our DJ that night! I would highly recommend Bernie Brown for any bride – he completely met my needs for a reliable, flexible, top of the line yet budget friendly service – without a doubt!" "Thank you so much for the great job you did as our DJ! You really helped our special day go alot smoother! Thanks Again! 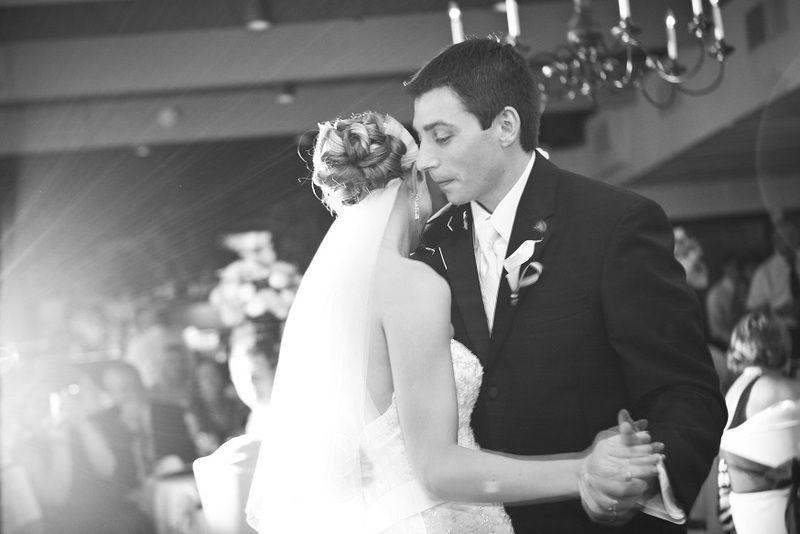 "Thank you so much for everything you did to make our wedding day perfect! We had a great time at the reception and we are still getting compliments for throwing a great party - thanks to you! Thanks Again." "Hey Bernie, Hope all is well with you. 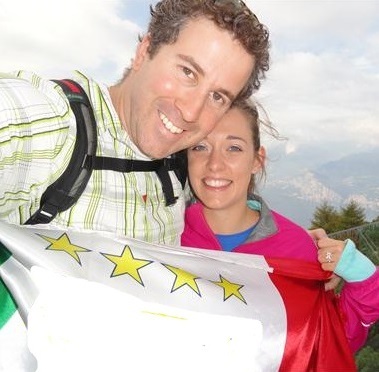 We just got back yesterday from our honeymoon and I didn't get a chance to email you earlier and let you know what an AMAZING time we had at our wedding and you really played a major role in that. You were AWESOME!!!!!!!!! We couldn't have asked for more. Thank you so much for everything." "Bernie, We just wanted to drop you a quick line to thank you again for doing such a fabulous job with the reception. You kept everything moving right along and it went great!! Thank you so much for all of your help we really appreciate it!! We will definitely recommend you to anyone looking for DJ services. Thanks again!" 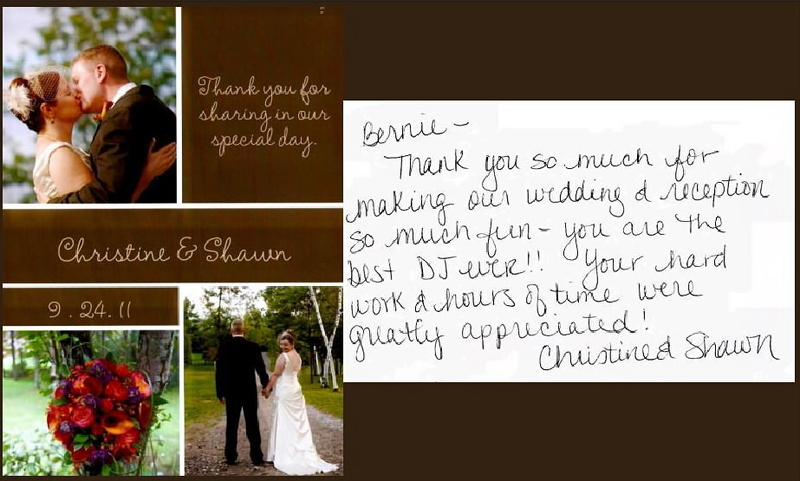 "Dear Bernie, We just wanted to thank you for your excellent and professional DJ work at our wedding on October 31st at the Malone Golf Course. We couldn't have had a more perfect musical presentation, you made our day. Again, we thank you very much." "Hi Bernie, We just wanted to write you a quick note thanking you for the wonderful job Saturday night! You really know how to keep the party going! There have been so many compliments from friends & family about "how fun the reception was" & that is definitely what we wanted!!! You went above & beyond any expectations we had! The remix you put together for the Father/Daughter dance was amazing! You can expect great recommendations from both us and our families! Thanks again Bernie! ~ Jake & Nicole Martin : )"
"Dear Bernie, Thank you for exceeding any and all of our expectations. 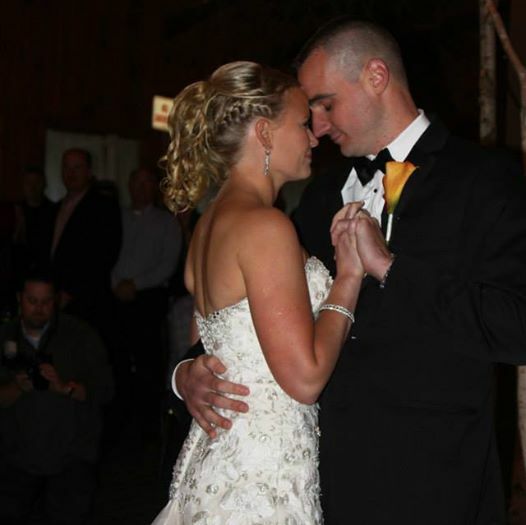 You went above and beyond, making sure we had a wedding night to remember. Everybody (and I mean everybody) was complimenting the mix of music you had put together. You read the crowd perfectly! We also thank you again for doing the extra research for our traditional Jewish dances. I think they went as smoothly as we could have expected. It was really funny seeing some of the pictures of Katie's face when she was up on the chair. From set up to break down you were extremely professional and even helped out to trench the extension chords. We hope you had as great a time as we did. Please feel free to list Katie and myself as references for any of your future clients." "We had confidence after meeting Bernie that he would do a great job at our wedding reception, but we had no idea how much. He did a fantastic job of honoring all of our requests and really listened to us in order to get a feel for the type of reception that we wanted. At the reception, he was extremely organized and made the entire evening run smoothly. We didn't have to worry about anything. He had a great flow to the music and kept everyone dancing. He also took requests from our friends and family and played music right up until the very end of the evening. Bernie was a pleasure to work with and we would highly recommend him for any event. 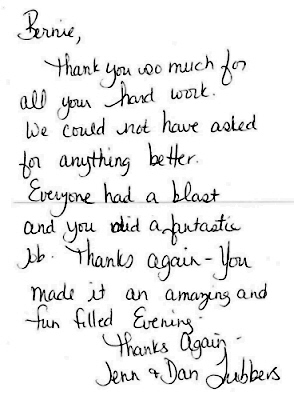 We truly think that you did an amazing job and do not have any complaints. Everyone that we spoke with said that this was the best wedding that they had ever been to. We would be happy to send you some photos once we get them. Thank you so much for playing music well after the evening was over. My friends and family had a blast." Tyler and I just wanted to thank you for making our wedding reception absolutely perfect. All of our friends and family said they had never been to a reception where they had more fun dancing all night. Thank you also for staying the extra time, obviously no one was ready to go home yet. You played the perfect mix of music for the guests we had which was proven by a full dance floor the whole night. 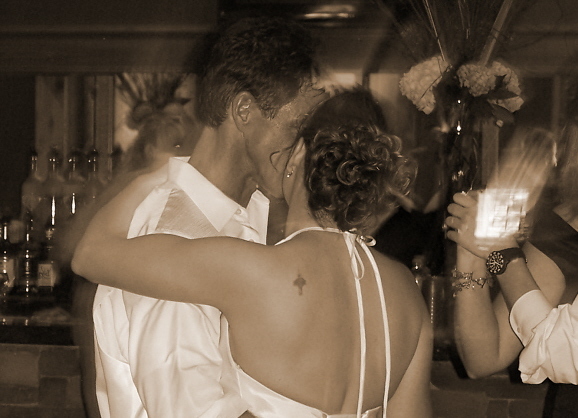 We will recommend your DJ services to everyone we know having a wedding/party in upstate new york. 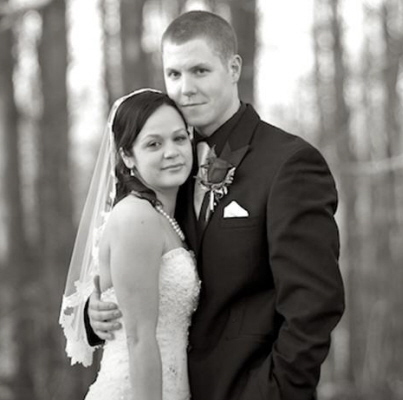 Thanks for all you did for us to make our wedding day so special and memorable!" We just wanted to let you know how much we loved your services at our reception. You did an amazing job that went above and beyond what we could have ever expected! We were truly blown away with your attentiveness. You really know how to keep a crowd entertained. 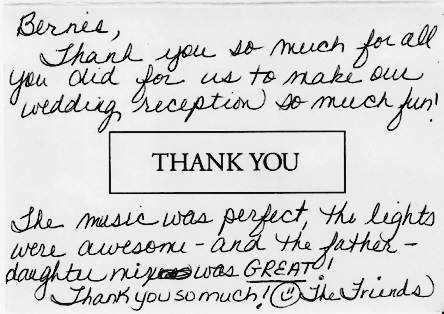 We greatly appreciate all of the extra work you put into making our reception a wonderful experience for us - thank you! We hope you have a wonderful Christmas and New Year! Take care." We have been on our fake honeymoon and just got back Sunday night. School started right away for me so it's been a bit of a whirlwind this week. We are still on such a wedding high. I'm sorry I'm writing to you so late, but I want you to know how amazing you were! Thank you soooo much!!!! You seriously rocked it out and did such a great job! If there is anything we can do, or be a reference just let us know, we loved you! I still can't believe Kel sang to me, that was def my favorite moment :) Thank you again soooo much for the greatest moment of my life! Thanks again for your great work at the wedding! We had a FANTASTIC time. I really could've gone all night! I never wanted it to end!!! You did a great job and everything looked and sounded fantastic! Thanks again! We had an awesome time at the wedding. The music was perfect, we had a blast dancing to our old college favorites. 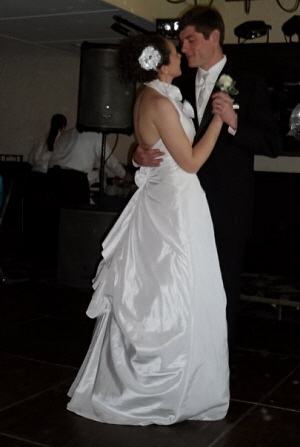 I actually had to tell my dad to put a time limit because we would have danced all night! The flow of everything went awesome. And thank you so much for the CD of our songs, we have listened to it several times already! Thank you for a great event! !